A few weeks ago I was browsing Pinterest and found a link to a blog (I would link to it but apparently I didn’t pin it so now I have no idea what it was called!) where the lady had like 20 gift ideas for under $5. There were a few things on there that I thought I might try with MiniMe. 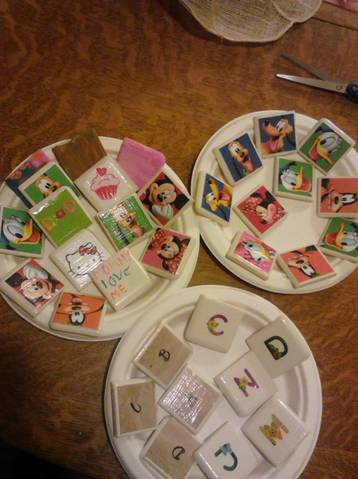 One of them was using 3″ ceramic tiles (you know, like the stuff in your shower) and decopage different stuff on them (One of her ideas was using scrapbook paper) put little felt feet on them and make them into coasters. Same idea could be used to make trivets. Well, I work at a thrift store of sorts and we happen to have a whole bunch of tile that exact size for $5 a box! There are 50 tiles in a box! Well, yesterday MiniMe came to work with me and she found some boxes of even smaller tiles. Like 2″ size. 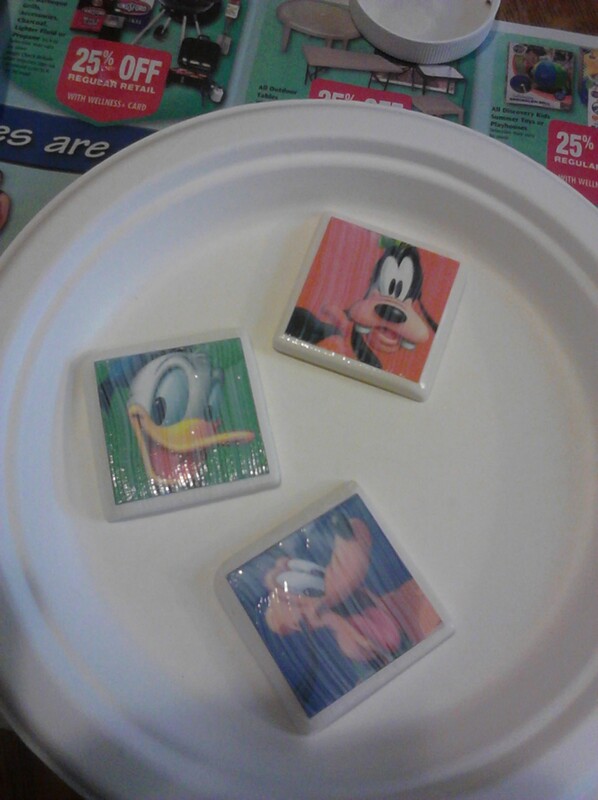 I think they’re actually used as the edge pieces. Anyway, we each got a box of 20 for $1 each. 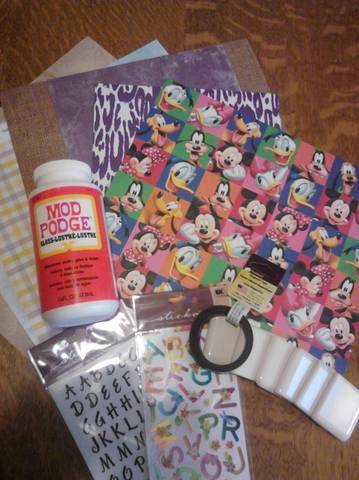 Last night we went to Michael’s and got some different papers and some ModPodge glue stuff and some magnets. This is the cast of characters. We used ModPodge, various kinds of scrapbook papers and stickers. TaDa! There are a few here that MiniMe painted with acrylic paints because she just wasn’t patient enough to way for me to get ready to do the rest of the stuff. Anyway, this is why I love Pinterest. For a few bucks, my daughter and I actually had a good time for a few hours and got to make something that didn’t take much effort. I’m all about easy here!